*ar-chi-tec-ture: the complex or carefully designed structure of something. I've always been interested in architecture. And that's probably because I've always had a fascination with how something is designed - its structure and form. When I think back on the various careers I've had, in a way, many of them have been a form of architecture. Like when I was a hairstylist, I was an architecture of hair. When I apply makeup to a woman's face, I think of it as architecture of the face. Tom Ford, who is a well-known American clothing designer, had originally attended school to become an architecture but then found himself designing clothes. And in an interview I once watched, Ford said that all the things he learned as an architecture taught him everything he needed to know about designing clothes because clothing is architecture of the body. And if you think about it, even things such as: photography, writing, and web and graphic design, are also architecture because they involve structure and form. So perhaps much of creativity involves architecture. For the past couple of weeks, I've been outside enjoying our spectacular spring weather; taking photographs with my still-new camera. 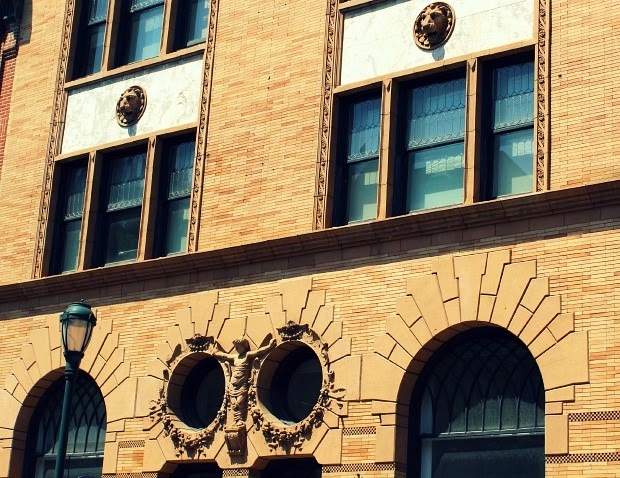 And if you've been reading my blog for sometime now, you know how much I admire the architecture of Philadelphia. It's a marvelous amalgamation of old mixed with new. And it amazes me how so many people who live here (especially the natives), no longer notice the architecture because they just take it for granted. Yet me, I'm always looking up, down, and all around; savoring its form, detail, beauty and history. Have a picturesque weekend everyone! You are absolutely right on all counts. I have always admired buildings, especially the more ornate ones like your City Hall and old churches. Did I tell you that the first time I visited NY I got a crick in my neck for looking up so much. I think I was in disbelief over the magnificence of it all. Great Friday post, Ron. Enjoy your weekend. Daughter is over from Oz so we're going to have a cracking time. As I get older, I so appreciate the beauty around me, whether it's natural or man-made. I love the photos you posted. The Walnut St. Condos are gorgeous! And 13th Street looks like a happening place! (Having trouble with comments) Where I live, the Western Reserve style is very popular and I love it. Hope your weekend rocks, Ron! You're so right - there is architecture in everything including nature. Your shots are so beautiful! Ron, very interesting post. You know, I've never thought of hair, makeup and clothing as architecture on the body but you're right, they are because they all have to do with design. Don't you love Tom Ford? Not only is he gorgeous, but he's so talented. I don't own any of his clothes but I do have one of his fragrances (Velvet Orchid) and I love it. My girlfriend got it for me for my birthday last year. It's my favorite perfume. These photographs are wonderful! I love the black and whites, but I also really like #8. Philadelphia looks like such a cool city. Have a wonderful weekend, Ron x And I hope your new job is working out well! 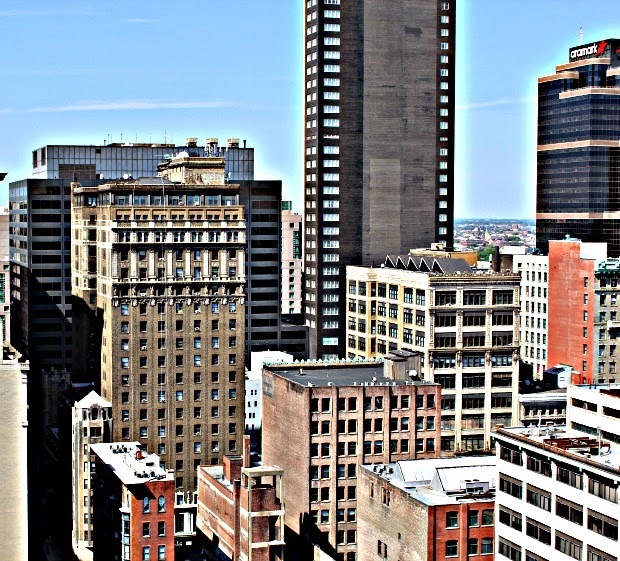 Ron, you have such a knack for capturing the beauty of Philadelphia in your photographs. You make me want to get out there and explore more of the city than I do. As you know, I'm not crazy about Philly but it does have some of the most gorgeous architecture. Love the shot of City Hall. And the one of the Bellevue Stratford is stunning. #3 is beautiful as well. Question, where is that exactly on 13th Street? I can tell, you're really enjoying that new camera. Great pictures! "Did I tell you that the first time I visited NY I got a crick in my neck for looking up so much. I think I was in disbelief over the magnificence of it all." HA! I do the same thing whenever I'm there. And for as many times as I've visited, I still look like a tourist visiting for the first time!
" Enjoy your weekend. Daughter is over from Oz so we're going to have a cracking time." OMG...I bet you're so happy to see your daughter! Have a SUPER cracking time, dear lady! Thanks for stopping by! "As I get older, I so appreciate the beauty around me, whether it's natural or man-made." Yes, me too! And I think that's because as we get older, we see things differently and appreciate them more. "And 13th Street looks like a happening place!" Yes, it is. 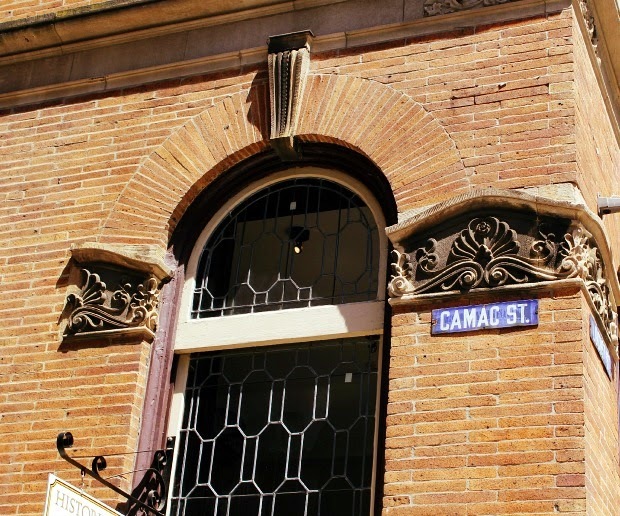 It's filled with restaurants, wine bars, and some unique shops that are privately owned. On the weekends it REALLY hops! So sorry about that. Yes, Disqus seems to be acting weird the past couple of days. I keep getting comments posted to both my Blogger dashboard AND Disqus, so I'm receiving double comments. Hopefully they'll fix it. "Where I live, the Western Reserve style is very popular and I love it." "there is architecture in everything including nature." Great point! Yup, there is architecture even within nature! "Don't you love Tom Ford? Not only is he gorgeous, but he's so talented. I don't own any of his clothes but I do have one of his fragrances (Velvet Orchid) and I love it. My girlfriend got it for me for my birthday last year. It's my favorite perfume." LOVE Tom Ford! And it's ironic you mentioned his fragrances because in my new job, we sell them. To me, he creates the most gorgeous and well-made fragrances. I have a friend in Florida who works for his beauty line. Thank you, and yes, my new job is working out very well. Glad I made the move. Have a fabulous weekend, girl, and thanks for stopping by! Thank you :) I am so enjoying my new camera.Still lots to learn.
" As you know, I'm not crazy about Philly but it does have some of the most gorgeous architecture." Yes, I'm not crazy about Philly as well but I do think it has some of the most stunning architecture. "Question, where is that exactly on 13th Street?" It's between Chestnut and Walnut Streets. They've done a lot with that area in the way of putting in some really great restaurants, wine bars, and shops. It's VERY busy on the weekends. Wow, what beautiful photos! And what a great post! I love your observation that much of creativity involves architecture. I think that is absolutely brilliant! Structure is vital in any art form, so you're building something even if you're writing poetry or painting a picture. These images are priceless. I've always thought you've had a great eye, Ron, but I really think you should strongly consider entering photography contests (assuming you haven't already). You really have a gift! Thanks so much for the fabulous photos! Have a great weekend, buddy, and keep clicking away! "Structure is vital in any art form, so you're building something even if you're writing poetry or painting a picture." Yes, exactly. And one of my readers also mentioned something in her comment about "nature" being a form of architecture, and she's right, it is! "I really think you should strongly consider entering photography contests (assuming you haven't already)." Aw, thank you for your encouragement and kind words. No, I haven't ever entered a photography contest but perhaps it's something I should look into. Thanks for the suggestion. Have a fantastic weekend, buddy. And thanks for stopping by! "And if you think about it, even things such as: photography, writing, and web and graphic design, are also architecture because they involve structure and form. So perhaps much of creativity involves architecture." Ron, I love your take on that. Insightful observation! I'm going to share this post with my girlfriend because she's a web designer and would find it interesting. Beautiful photographs. #8 is just the coolest. Love the murals. #4, wow! #8, what is that building? I've been thinking a lot about this lately, so I decided to post something on my love of architecture. And there was a time when I actually thought about going to school for it. Architecture fascinates me. Aren't the murals fabulous? 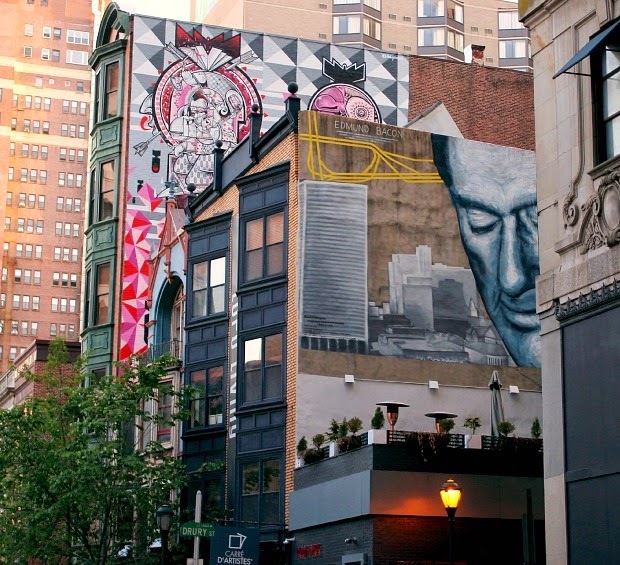 Philly is infamous for it's murals (and mosaics). "#8, what is that building?" It used to be a hotel, but is now primarily an office building with shops and restaurants in the lobby. It also has a Hyatt Hotel attached to it. Here's a link in case your interesting in reading about the history. It's a gorgeous building! Thanks so much for stopping by, buddy. Have an excellent weekend! "I know exactly where all of those are." " I was never really into architecture, but I did love wandering Philadelphia to look at all the old buildings, and those fountains out by the art museum." Yes, I love those fountains by the art museum (Logan Square). That whole area is so beautiful. "Such an interesting city. ......at least in daylight in Center City. Alone in the dark anywhere else, not so much..."
You're right, certain areas of Philadelphia can be very shady. I LOVE seeing pics of your city and in particular, the old buildings you share here. So beautiful and unique. Here in Canada, all too often, they rip them down and put up some ugly modern replacement buildings, instead of trying to maintain the old, beautiful ones. Thanks for sharing these Ron. I can picture you looking up, down, and around when you wander the streets of Philly, Ron! You strike me as very artistic, and that comes out so beautifully in your photos. I think it's especially cool how OLD some of those buildings are -- sometimes we in the Midwest forget how many years passed before folks migrated out here, so our buildings are much more recent. And I suspect that's true, the farther west one goes. Domer was BIG into Legos all through his growing up years, causing me to wonder if he, too, wasn't aiming for an architecture career. But no. I like the way you've correlated it to the other career fields, though, and I can surely see its connection to web design! Thanks for taking me along on your jaunt, dear -- have a super weekend! Beautiful photos, Ron. Architecture fascinates me as well. I love that you look at and approach a woman's face as architecture.
" Here in Canada, all too often, they rip them down and put up some ugly modern replacement buildings, instead of trying to maintain the old, beautiful ones." Wow...I surprised to hear that. Here in Philly, they are very adamant about keeping the old buildings standing; especially the historical ones. So they will refurbish the exteriors and interiors; keeping the look. I think because Philadelphia was our nation's capital for 9 years, they're very sentimental about holding on to that history. "My heart goes out to the people who died or were hurt in the train derailment in PA, just reading about this again this morning. May they RIP and may the answers come soon, why this happened. :-("
Thank you for your concern, my friend. Yes, wasn't that tragic? And I'm surprised that only 9 people died in the accident because that train was a wreck. One of the tenants in my apartment building is an E.R. nurse and was on duty at the hospital the day they brought many of the passengers in. She said it was pandemonium. Have a super weekend and thanks so much for stopping by, Geraldine. "I love that you look at and approach a woman's face as architecture." Yup, to me, women are beautiful works of art! "I think it's especially cool how OLD some of those buildings are -- sometimes we in the Midwest forget how many years passed before folks migrated out here, so our buildings are much more recent. And I suspect that's true, the farther west one goes." Yes, you're absolutely right. I think many Americans forget that Philadelphia was our nation's capital and how old it is. I LOVE the architecture here because there are so many of those buildings still standing. And it's funny because when you walk past them, you can literally FEEL the history within them. "I like the way you've correlated it to the other career fields, though, and I can surely see its connection to web design!" Have a super weekend, my friend. And thanks a bunch for stopping by! Gorgeous photographs, Ron! I can see your photography skills growing more and more, and it's wonderful to watch. I love #'s 1, 4, 6 and 8 especially. But that last photo is also a winner! And you're so right about architecture being in many forms. I like your view on that. How is the cost of living in Philadelphia, Ron. Is it expensive? Thanks for letting me know, Ron. My husband and I may have to visit that area soon because it looks quite nice! If you want, please email me if you should come up to that area because perhaps we can meet up. I'll send you my phone number. Thank you :) I am so loving this new camera and learning new stuff. I'm glad I got it because it makes me feel more involved with manual mode. "How is the cost of living in Philadelphia, Ron. Is it expensive?" Compared to a city like NY, it's very reasonable. However, I have noticed over the past several years that rent prices are starting to climb. As far as food and clothing goes, it's pretty much the same as it was when I lived in Florida. Also, food and clothing are not taxed in PA.
Great idea! Will do, Ron! You, sir, are an artist in so many ways. From your writing to your photography to your overall style. These are stunning.... I always look at your photo posts a few times. I scroll through quickly then go back up and then down really looking at each. You capture so many amazing things... the colors, the shadows, the beauty, and the beauty in decay. LOVE these. If I were to pick two favorites? #1, #3, #4... yea, that isn't two... but what can I say, I couldn't choose!!! Katherine, my dear friend, your comment made me smile and blush. Thank you for your sweet, kind, supportive and encouraging words. And may I say to you, all the things you said to me. YOU are an artist in so many ways. And I REALLY mean that! Hope you had a super weekend and thanks a bunch for stopping by! I have also had an interest in architecture. I loved playing games that allowed me to build cities & design houses for my characters. I spent more time designing the houses than actually playing with the characters.
" I spent more time designing the houses than actually playing with the characters." HA! Yup, you definitely have an interest in architecture, Benze! That is so cool, I had no idea they even had games like that! Have a FAB week, my friend. And thanks so much for stopping by! Great shots, as always. Love the first one especially. B&W is the perfect medium. "Like when I was a hairstylist, I was an architecture of hair." Ooh...I wanna play! I'm a content specialist, so I'm an architecture of words. Fun! I was an office manager once, so I was an architecture of managing an office. Ooh! Groovy!! The guy down the street from you makes killer cheesesteaks, so he's an architecture of delicious Philadelphia cuisine. YES!!! Thank you, Mark :) I love black and white as well. There is something so dramatic and yet simple about it. "I'm a content specialist, so I'm an architecture of words. Fun!" Yup, you definitely are architecture of words, hands down!
" The guy down the street from you makes killer cheesesteaks, so he's an architecture of delicious Philadelphia cuisine. YES!!!" " I've always loved architecture...of all periods. My dad was an architectural engineer so I guess he successfully combined both sides of his brain with the creative and logistical. I tried to follow in his footsteps, but to no avail. ;-) I"
Yes, but you are an architecture of writing AND photography, so you did follow in his footsteps! "I tagged you in a post a couple days ago. I hope you play! https://peripheralperceptions...."
OMG, I must have missed that post, which I'm shocked because I get your updates on my reader! I will be sure to stop by tonight to check it out. Ron, what store is Tom Ford's beauty line sold because I would love to see it? Denise, my friend works at Neiman Marcus, but I think you can also find his line at Saks and Nordstrom. 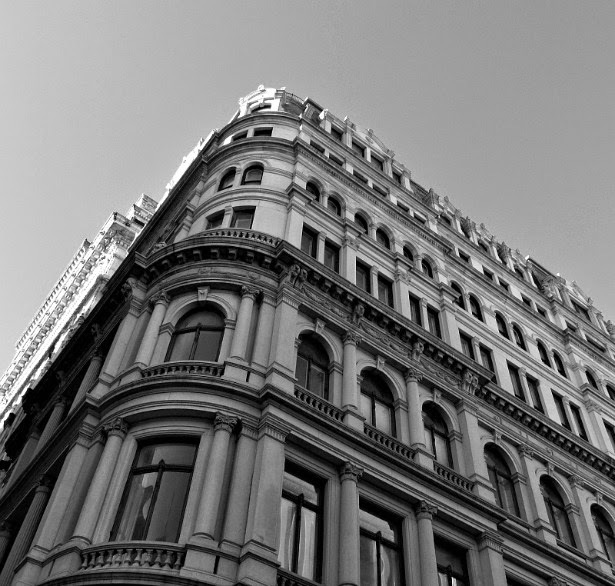 Philadelphia was some really beautiful buildings. I imagine if you live in a city you;d be more keenly aware of architecture since you are surrounded by buildings. I live in a neighborhood with lots of old houses - many built during WWII or (like mine) immediately after. I love going for a walk by the variety of house styles. 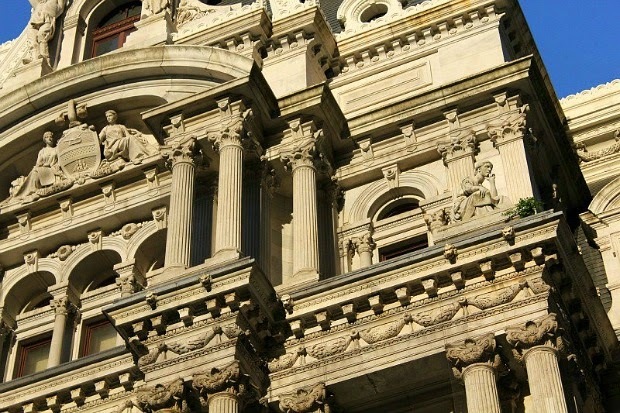 Yes, Philly has some AMAZING buildings and architecture!
" I live in a neighborhood with lots of old houses - many built during WWII or (like mine) immediately after. I love going for a walk by the variety of house styles." Yes! And I actually prefer older homes to new. Philly (because it's an old city) has some incredible brownstone homes that are breathtaking. 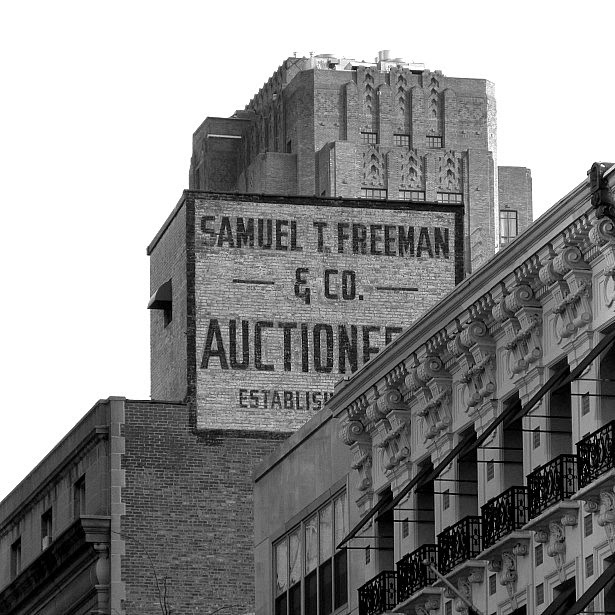 To me, an old building has a history that is contained within it, that you can FEEL.